Netherwood Films - 90 min. Principal Cast: Owen Black, Will Hall, Miriama Smith, Mick Innes, Peter McCauley, Peter Rowley, Xavier Horan, Zara Cormack. Screenplay: John Argall; Photography: Paul Tomlins; Editor: Cristobal Araus Lobos; Original Music: Tom McLeod, Delaney Davidson; Art Director: Sophia Guthrie; Makeup Design: Suzy Lee; Wardrobe Design: Trudy Munro; Producer: Owen Black; Director: Cristobal Araus Lobos. 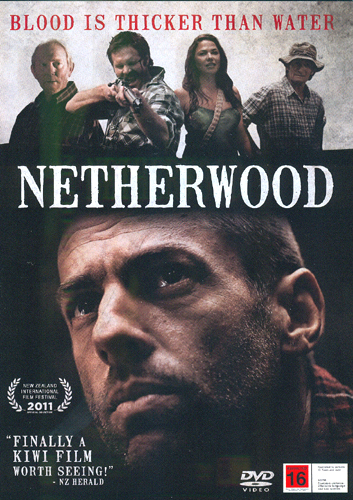 Stanley Harris(Owen Black), a drifter with some distant local roots, returns to the small country district of Netherwood. He unwittingly inherits a prime piece of land coveted by local wealthy landowner Duncan Moore(Peter McCauley), aided by his thuggish son Mex(Will Hall). Stan attracts the attentions of Maria(Miriama Smith) and complicated love interests develop. A slow-burning war ensues and culminates in a primal battle between the men for power and dominance. This Western style drama was shot around the Canterbury towns of Waipara and Amberley with attractive photography and memorable music. Worth a view. An NTSC R0 DVD is available at The Official Website, with a $25nz payment via PayPal. It is presented 1.78:1 with a DD 2.0 spoken English soundtrack. There is an optional commentary track with Will Hall, Owen Black and Christobal Araus Lobos. There are no subtitles. The only extra is a 15min. mini documentary 'There and Back' The Netherwood Rural Roadshow. You can enjoy some samples of Tom McLeod's Original score at his website. Singer and Songwriter Delaney Davidson Website with five samples used in Netherwood - 'Told A Secret', 'Dark Horses', 'Slept Late', 'Dixon Lie', 'Time has Gone'.